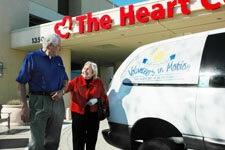 Every day in Brevard County there are frail and elderly residents who need your help. These seniors live at home, on limited incomes. They are able to live independently through supportive services such as the Volunteers in Motion program. A few hours of volunteer support, once or twice a week, can make a major difference in these senior’s lives. Whether it is driving a van or answering a phone, our volunteers serve because they care. For information about how you can volunteer, contact Lori Hamilton, the Volunteers in Motion Coordinator, at 321-635-7999, or E-mail us! Transit One is a non-governmental, non-profit agency, established to strengthen and expand public transportation and mobility options in Brevard County. The goals of Transit One include building support for public transportation, advocating for investment by stakeholders, and providing a forum to interact, exchange ideas and improve mobility services. The organization meets on a quarterly basis; Transit One membership is free for any individual, organization, company or institution working to accomplish the mission and objectives of Transit One. For questions or additional information, contact Transit One. The responsibility of the Space Coast TPO is responsible for managing a continuing, cooperative, and comprehensive planning process, resulting in the development of transportation plans and programs that improve quality of life and add to the economic viability and safety of the community. Public input is sought throughout the planning process at public meetings and workshops. The Space Coast TPO provides a forum for cooperative decision making by officials of the affected governmental entities with input from citizens and constituency groups. These plans serve as the framework for making transportation investment decisions in Brevard County. To get involved, contact the Space Coast TPO at 321-690-6890 during normal business hours 8:00 a.m. to 4:30 p.m. Monday through Friday. The Local Coordinating Board for Transportation Disadvantaged Service (LCB) provides agency and citizen input regarding the coordinated transportation system in Brevard County. This board meets periodically. If you would like more information, please contact our administrative office at 321-635-7815.